As stated earlier, iPhone 6s leaks will continue to pour in as long as Apple does not come around to announcing its flagship duo next month. 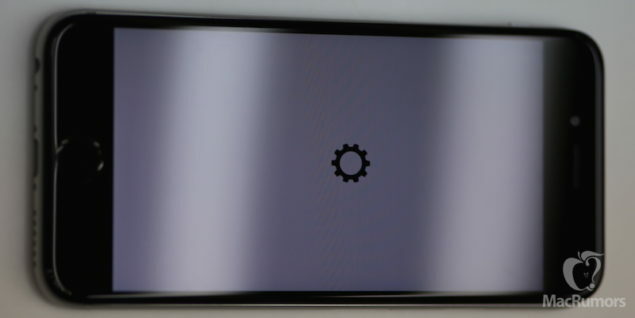 On this occasion, we were able to witness the handset boot up with a gear logo present right in the middle of the screen, along with a handful of internals. 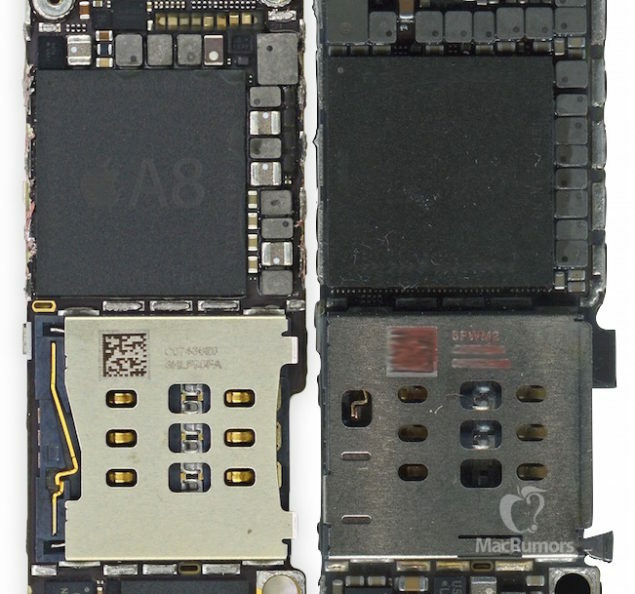 We have already come across several images of iPhone 6s, which includes the Cat 6 LTE modem that was manufactured by none other than Qualcomm. Now, coming to the other components, you could see that the smartphone was void of the rear camera, but as far as the remaining internals go, they were sufficient enough to power on the handset and allow it to boot up. One major difference between iPhone 6s and iPhone 6 is the presence of Force Touch tech, which allows the device to sense how hard the user is pressing on the display, subsequently activating a certain function in an app. While there was no evidence that the Force Touch tech was present, there are some prominent changes between the logic board of iPhone 6 and iPhone 6s that show the upcoming device will indeed possess such a feature. 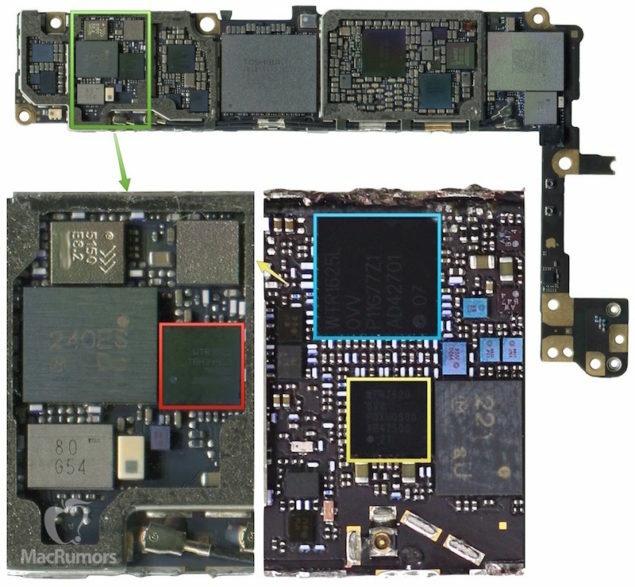 Additional images show that the logic board features Qualcomm’s MDM9635M LTE modem. The modem has been fabricated on the 20nm process and will provide faster speeds while connected to LTE networks. Now, another revelation that we came across was that the LTE modem will be paired with Qualcomm’s WTR3925 radio frequency transceiver chip. The primary function of this chip will be to enhance cellular network performance. This chip is processed on the 28nm architecture, which is a huge jump from the 65nm WTR1625L chip present inside the iPhone 6 duo. The capability of WTR3925 will not require Apple to incorporate another chip since this one will effortlessly be able to increase data speeds. In short, power and efficiency are both increased while consuming less space on the logic board. We know for a fact that iPhone 6s will be running Apple’s A9 SoC, although the image does not reveal any markings of the chipset and the amount of RAM. However, one primary difference that we did manage to see was that A9 is approximately 10 percent larger in area as compared to the A8 package present in the iPhone 6. The most logical explanation for this is that the increased size will add more functionality to the chipset while enhancing efficiency. Looking at the differences between the two logic boards, we have to say that iPhone 6s is going to be a severely upgraded handset over its predecessor. We will wait for more leaks to come by and update you accordingly, but for now, what did you think of the components?